Hired by Dexter Construction, HEC developed the full demolition design and phasing for the existing south structure of the Fairview Overpass. The bridge was redesigned and replaced due to the age and condition of the existing structure, coupled with the fact that the structure was similar in construction to that of the highway overpass in Laval Quebec that collapsed in 2006. The critical detail of concern was the bearing support corbel for the middle drop in span that was lightly reinforced and inaccessible for proper condition surveys. HEC developed a demolition method that involved removing the deck and interior diaphragms from the top of the structure while avoiding a potential overload in the corbel areas, positioning cranes beneath the structure and lifting the concrete girder segments onto a flatbed truck. The interior drop-in span girders were removed first, followed by the exterior spans. In addition to ensuring the stability of the girders throughout the demolition operation, HEC also developed crane positions for each phase and ensured that the lifts were within the limits of the available crane sizes. 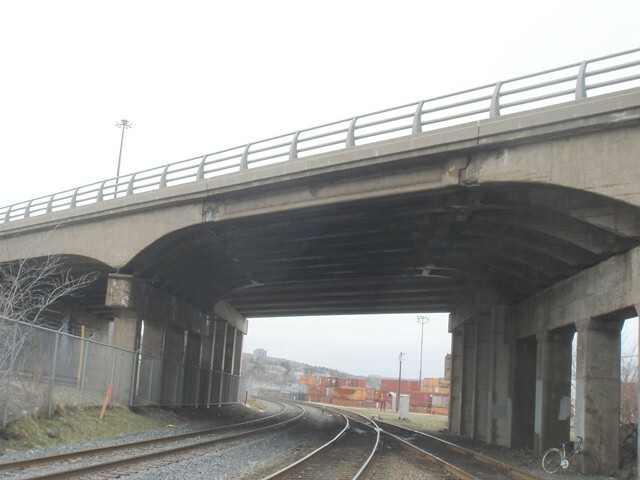 The detailed demolition plan ensured that all demolition operations were completed within the allowable closures for both Joseph Howe Drive and the adjacent rail line. At the onset of the project there were significant concerns from citizens as to the delays that would result on both the Bedford Highway (above) and Joseph Howe Drive (below), both of which are major arteries for vehicles travelling onto or off the Halifax peninsula. The detailed demolition plan limited closures and delays on both roads to the point where public sentiment throughout the actual demolition was overwhelmingly positive.